The transaction immediately shows up in your bank’s account register and begins the process of being or cleared. You do not go into debt for the purchase or have to wait for the transaction to be billed on a credit card statement. You don’t have to wonder during the month about how much you have or haven’t spent. It’s all recorded in your bank register which you can easily see with access to online banking. This immediacy of transaction forced me to monitor my accounts in real time – day after day. Much like a restrictor plate limits the power of a race car and how fast it can go, a debit card limits the speed at which I can spend money. It forced me to slow down and pay attention to how much money was in my bank account. In essence, the debit card limited the potential damage I could do to myself. As I slowed down my spending and paid more attention to our bank account, discipline was developing in my life. The bad habits of excess spending were gradually being replaced by patience, delayed gratification and frugality. 2) We began to save more. Both of these changes were huge revelations for me. My reckless spending had never allowed our budgets to work. We saved very little from month to month. In that respect, it was as though our decision to switch to a debit card had given us a raise. That’s what it felt like. 3) spending is reduced and more savings is created. There is a great deal of confusion about the security surrounding a debit card. Many feel they do not offer as much protection to the consumer as a credit card. I heard all of these reports before we signed up for ours. So I did my own research at Visa’s website. Here is what I found and how we protect ourselves. When we swipe our card at checkout, the screen presents two options to select – debit or credit. If you select the debit option, you must supply a PIN number given to you by the financial institution. This is where the risk comes in. If someone knows your card number AND your PIN, they could gain access to your bank account. So instead of choosing debit, we select the credit option. Even though you select the credit option, the card still functions like a debit card in that it immediately records the transaction to your bank account. At that point a ticket is printed that you must sign to complete the transaction. That’s when the protection kicks in. When we sign for a purchase we are protected under Visa’s Zero Liability Policy. It protects us from unauthorized charges and returns any funds that are fraudulently taken from our account. All these policies are documented at Visa’s website. So for enhanced security, I never use my PIN when making a purchase. Is a debit card right for you? The answer to the question really boils down to what you value as a consumer. If you value spending beyond your means, then don’t get a debit card. You will kill yourself with account overdraft fees. Those penalties come when you try to spend money on your debit card that’s not in your account. If you value cash in your pocket and plan on going to an ATM three or four times a week to make a withdraw from your account, then don’t get a debit card (even though many would list this flexibility to access cash as a positive for debit cards). In the end, you will be racking up to many fees the ATM charges you to access your money. If you value building reward points for travel, then debit cards are not for you. Debit cards typically don’t offer those programs like credit cards do. If you value building your credit score for future loans then don’t use a debit card. Debit cards don’t help you build credit. That only comes through the paying off of credit card and other debt. If you are having trouble controlling your spending and want to create some discipline in your life, debit cards (or cash) are the way to go. You will find it easier to spend less and save more. And that’s going to feel like a really good raise. Questions: Why have you chosen to use either a debit or credit card? What other advantages of a debit card can you think of? 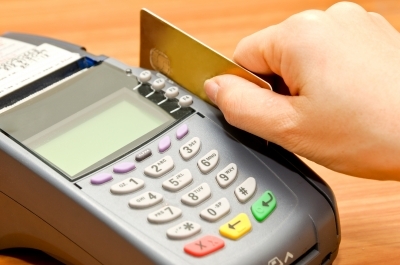 Have credit cards hurt or helped you manage money? When we started paying off our cards, we stopped using them. We use a debit card pretty much exclusively. All the “experts” recommend cash, but we find it’s easier to track our spending with a debit card, and we are actually less likely to spend with it than if we have some cash in our pockets. But, I use to be in a bad way with those overdraft fees, so it’s only now that I’m able to state with confidence a debit card is for us. I carry very little cash. Debit cards do provide some safety in case of theft, whereas carrying large amounts of cash does not. True enough. I enjoyed a credit card too much. I used to alternate between using my debit or credit card. Now that I’m trying to get as many points as possible, I use my credit card. When I used my debit I always selected the credit option, though. My boyfriend uses his debit card exclusively (mostly because he is too lazy to sign up for a credit card), and always selects the PIN option. He’s only had one instance where his bank had to send him a new card. I do like that debit transactions are counted right away, and I always made sure I had enough in my bank to cover a purchase. Get the bf off the PIN EM! 🙂 One instance would be one too many. Problem with signing is that some cashiers will ask to see your driver’s license, which has your home (and probably billing) address on it. You don’t want someone to have your card number and the billing address. So I select “debit” and use my PIN. I guess that could be a risk. Rarely does a cashier ask for my driver’s license though. Plus they don’t know the full card number anyway because only the last four digits are visible when the receipt prints. I think the risk is greater in using the PIN. By using the PIN you are not protected under Visa’s Zero Liability Policy. Their own website says so. I used debit exclusively when I was first starting out because people SCARED me about using credit cards. That was very good training for how we use our credit cards now – we treat like debit (spend money that we already have in the bank, during that budgeted period) and pay them off 2-3 times per month. We enjoy the rewards. I think online banking really changed the stereotype that you wrote about. Your credit card spending is not an unknown until the bill comes a month later. To our tracking system, it doesn’t matter what’s spent on debt and what’s spend on credit – a the end of the month, there has to be enough in checking to pay off the cards, and the balances are easy to check along the way. You are right Emily…online banking has changed the way you can track your spending even with credit cards. I think most people though aren’t as diligent with checking their account as you are. When I was having the challenges that forced the switch to debit cards, my spending was a unknown until the bill came because I didn’t look at it. So to be fair, that was probably more a discipline issue than a credit card issue. We’ve done both options before. When we started with Dave Ramsey, we went debit only for years. Then, when Perkstreet got rid of their 2% debit option, we went back to credit only…and that’s where we are now. We try to get some of that immediacy that you talk about by paying our credit card bills in full every week, so our checking balance is a truer reflection of how much money we really have (though it’s never really fully accurate, and it necessitates a little math on my part). But we’re suckers for the rewards. We’re churning cards left and right to get point, miles, etc. Right now we’re working on 16 free hotel nights in Europe: beats the pants off of 1% cash back. If you are paying your credit card bill off every week, that’s better than most. I’d guess most don’t even know how much they spend per month until the bill comes due. Looks like you are doing great with your churning of cards. I know that’s a viable strategy to gain rewards…I just don’t feel compelled to put the energy into managing that process. I’m with you. We use debit cards the majority of the time. Like you, I just love the immediacy of the transaction and that I can look at my account and know how much I really have, at any point in time. I never knew about the signing debit card purchases. I’ve never heard of that here in Canada at least. Here, all debit cards generally have zero liability policies. I know friends who were travelling out of country, and the bank called them up right after using their debit card to ask them if they were out of country. And if you’re talking security, I’d rather have piece of mind, than a better credit rating, if God forbid, something were to happen. Selecting the “credit” option at checkout and signing the receipt is the key to security for the debit card. Perhaps the standards in Canada are different, idk. “the immediacy of the transaction creates discipline as it demands I focus on the bank account” So true, and that’s why I had to stop using credit cards for awhile. And even now I do think it’s easier to slip up if you use credit cards, but I love the travel rewards! I don’t wait until the end of the month to pay my credit cards. I do it every couple of weeks to make sure I’m staying in check. I’ve read that so many of those reward programs are really good. I’m thinking the amount I’ve saved offsets the amount I would have received in travel rewards. So I guess I’d rather save the money up front and then use that savings to travel instead of being locked into a program. Seems like that creates more freedom of choice. I like to use credit cards mainly for the rewards, but also for the warranties and other perks that come along with using them. We have every bill that takes credit cards set up on auto billing and we pay everything off each month. If you can’t or think you might not, then the interest will kill you, and you need to use cash or a debit card. Do I think we spend more with credit cards? Not now. We did in the past and I never want to go back to that, so the credit cards are really just a way to travel cheaply for us. I would encourage everyone to become financially responsible before ever using them, though. We learned that the hard way! I could never make the reward programs of credit cards work for me. Maybe that’s because I was undisciplined with my spending at the time. I know one thing for sure though…I’ve saved a ton by not using them. In that way I think my savings has balanced out, if not exceeded, what I could have possibly earned as reward points. Ah, you do it right Brian. Most people don’t sign for their debit card purchases. That is where the problem lies. If you don’t swipe it as credit, then it all depends on how much your bank will keep you on the hook for. Some banks, many of the large ones, say that if you don’t report the fraud in a certain time, then you can be on the hook for $500. That is a lot of money. I use my credit card like a debit card as I only buy things that I can afford. I don’t have to worry about anyone getting my bank account info and it makes budgeting super easy for me. This required a massive mentality change for me, but I did it. “Most people don’t sign for their debit card purchases.” I’m surprised how many people don’t know this is the way to protect themselves. We use credit only, but for a lot of the reasons you’ve mentioned. I like using credit vs. cash because I like to be able to log onto my account and see all of the week’s transactions. I don’t wait for my credit card bill to come due to pay it either- I send a check from my bank account through online bill pay instead. Since I use a zero sum budget, I like my bank account to be empty at the end of the month. “I don’t wait for my credit card bill to come due to pay it…” You are being very responsible by doing that. Most people aren’t paying attention to how much they are racking up each month.